Mayor Crombie delivering her speech in Council Chambers at Mississauga City Hall. “Good afternoon, everyone, and welcome to 2016! 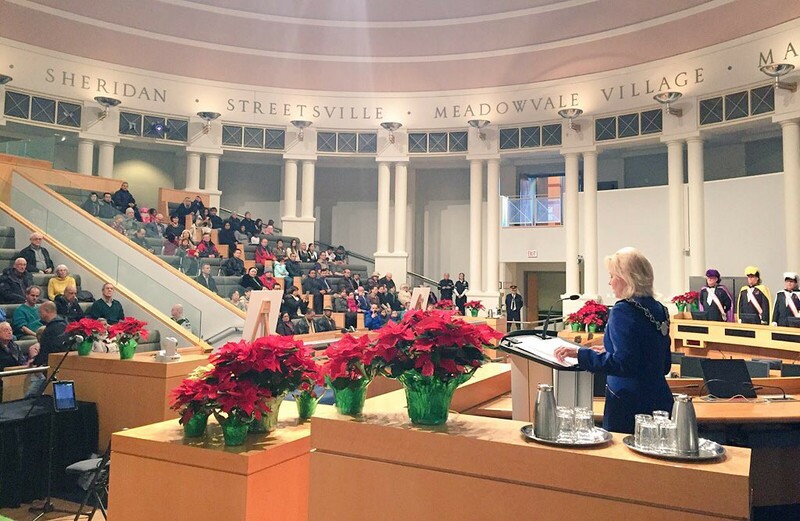 On behalf of the City of Mississauga, and Members of Council, it gives me immense pleasure to host you here in Council Chambers, as we gather to look forward to the promise and hope of the New Year ahead. “I want to recognize the committed public servants with us today. Thank you for your unwavering commitment to serve the people of Mississauga. “Each New Year is a special time of renewal and possibility, a time for all people to embark on exciting opportunities, overcome challenges, and exceed excellence. “I am proud of what has been accomplished in 2015. I am mindful that we have only just begun, and that there still remains much more work to be achieved. This is my resolution for the year ahead. “Through collaboration, Council hit the ground running tackling a number of leading issues for residents. “Some of our notable achievements include securing full funding for the Hurontario LRT. The LRT will connect GO Train Stations from Port Credit to Cooksville. It will run through City Centre – this very neighbourhood – and unleash the potential of our downtown core, allowing us to more aggressively get on with our Downtown 21, plan. The LRT will be linked to our MiWay Bus Rapid Transit System. “It will result in a more seamless travel experience for students to get to class at Sheridan College; enjoy a community festival at Celebration Square; take in a memorable performance at the Living Arts Centre; shop for premium brands at Square One and even attend a Mayor’s Levee! “Despite this great progress, we want to make it quicker and easier to move and bring people together. “Mississauga has brought together the municipalities of Toronto, Cambridge, Kitchener, Waterloo and Milton to get our communities moving. We initiated a business case study to build a new rail route that will connect the CP Line, just west of Trafalgar, with the already existing CN Line that runs through Brampton. “We call this new line, the Missing Link. And it will help make way for all-day, two-way, GO Train service on both the Milton and Kitchener GO Train lines. “Securing funding and support for the Missing Link is at the heart of our transit and transportation advocacy efforts for 2016. “Igniting economic development opportunities also continues to be a leading priority for the year ahead. “In Mississauga, we are blessed to be the destination of choice for so many hardworking, educated and thoughtful men and women looking to make Canada their home. “Diversity is one of our biggest strengths. It helps us connect culturally and economically to virtually every other country in the world. “In March, we launched the Mississauga International Partnership Program Committee (MIPP). This Committee is building on Mississauga’s cultural diversity to help our local economy reach its full potential. “Last summer, we leveraged these international connections during my first trade mission as mayor, to South America. But our work doesn’t end there. I will continue the practice of actively seeking out economic development opportunities and bringing foreign-direct investment to our City. “Later this month I will undertake a trade mission to India where we will connect with businesses looking to expand their global footprint in North America. Mississauga is home to a significant Indian diaspora and we have the potential to open our City to a great deal of Indian investment. “And, in April, I will join members of our Economic Development Office for a trade mission to Japan. Japan is one of the largest markets for investment in Mississauga. Mississauga is home to 97 Japanese companies, representing nearly half of all Japanese companies located in Ontario. “Mississauga is also proudly home to the beautiful Kariya Park – named for our sister city, Kariya, Japan. “We recently welcomed Japan’s Consul General to City Hall and I have met with our Canadian Ambassador to Japan, who is looking forward to hosting Mississauga yet again in Japan. “We are also pushing ahead with our agenda to make Mississauga a leading destination of innovation and entrepreneurship. Last April we held First Look – Mississauga’s first-ever angel investor networking event. “And the Mayor’s Taskforce on Innovation and Entrepreneurship, which met in December, will be moving forward with a number of new initiatives that connect budding new businesses with opportunities for capital investment and growth. “Our efforts to create a thriving economy are rooted in supporting Mississauga’s young people. A staggering 14% of youth aged 15-24 are unemployed. It’s simply unacceptable. “For these reasons, we have launched the Mayor’s Youth Speaker Series – an ongoing series of keynote discussions with prominent Canadians from a variety of sectors aimed at inspiring youth in Mississauga and providing them with guidance as they prepare to enter the workforce. “I am delighted to announce that the first event will feature a keynote and Q&A session with award-winning journalist Amanda Lang of Bloomberg News. “The inaugural event will take place on Monday, January 25th at Central Library’s Noel Ryan Auditorium from 7PM – 9PM. Space is limited to attendees 14-25 years of age and registration is mandatory at www.youthspeakerseries.ca. A strong network and connection to mentors can open doors for youth as they transition into the workforce. “We also have taken action to foster a more engaging, inclusive, safe, and welcoming Mississauga. “Throughout 2016, we will ensure affordable housing is an unwavering priority for future development plans and we will continue our efforts to secure funding from the provincial and federal governments to build more units. Residents deserve the respect, dignity, pride and safety that that come with having a place to call home. “The Diversity and Inclusion Advisory Committee continues to identify opportunities to ensure Council decisions reflect our population and changing demographics. “And finally, we want to thank everyone who continues to donate their time, talent and treasure toward supporting Syrian refugee families. In November, I called on the Region of Peel to create an action plan to ensure we are ready to do our part. The resettlement effort is a substantial undertaking that requires the dedication of all levels of government, and community groups, to properly deliver on. “While we usher in this New Year, let us not forget those in our community in need of additional care and support. “Last September and October, the Mayor’s City-Wide Food Drive Challenge raised nearly 150,000 pounds and $83,000 dollars – enough to distribute food for over 200,000 meals. The final results far exceeded the goal of 80,000 pounds of food. “But unfortunately, the need for donations remains high all year at our community food banks. Local charities always welcome donations so they may continue providing essential services. “I ask all residents to please be generous with their time. Engage in random acts of kindness. It could be helping a neighbour shovel their driveway; volunteering toward an important cause; or simply picking up litter to keep our streets clean. It is up to all of us to strengthen our neighbourhoods and make our City an even better place to call home. “Like the past year, 2016 already promises to be an exciting year of sport and athleticism. “We successful helped host the 2015 Pan Am / Parapan Games. The Toronto Raptors announced the Hershey Centre would become home court for their new NBA D-League franchise. “For the first time ever, Mississauga will host the Ontario Summer Games. Our City will welcome athletes, coaches, managers, teams, officials and fans from across the province in August. And this fall, we will host the 43rd Annual Skate Canada International. Don’t miss out. Get your tickets! “I will close by saying that we are moving Mississauga forward, together. We will face challenges but also many exciting opportunities. We will continue to make investments to ensure Mississauga remains of the best cities in the world to live, work, raise a family, and pursue dreams. “On behalf of Members of Council, let me once again offer my best wishes for a very happy, safe, memorable and prosperous New Year!